Jessica here! 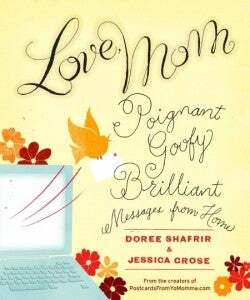 In honor of the publication of the book collecting emails, texts and IMs from mothers I co-wrote with Doree Shafrir, Love, Mom, here are our own mothers' answers to your mom-related questions. Q: How do I develop confidence that I will be a good mom? Doree's Mom: There's no magic good mom potion, but as long as you realize what you don't want to be, you're honestly on the right track. Q: How do I get my mom to stop obsessing over my ex-boyfriend and realize that some of the guys I pick will not be up to her standards? Jessica's Mom: Your mother doesn't seem to have empathy for your feelings. Set her down, explain that she is hurting you - don't do this in an argument or reactively. Do this quietly at a time when you can really make your case. After that, if she persists, you have to give it up. If she will not give your new boyfriends a chance, then you are spinning your wheels for no good end. Q: How do I tell my mom that I am a stripper? Or do I even need to? Doree's Mom: Try to gauge her reaction by telling her, "Do you remember so and so, she's a stripper." Jessica's Mom: But if you do tell her, don't expect (unless she is extraordinary), that she is going to approve. You have made a choice which I assume is important to you. If you feel that not telling her is an unacceptable omission of the truth, then by all means tell her, though sometimes a don't ask don't tell policy makes the most sense. Even if she doesn't approve, take pleasure in the other ways your mother shows care. Q: How can I get my mother to stop controlling me and treating me like a child? Jessica's Mom: The best way to handle this is to calmly discuss the situation, but if there is no resolution, I am concerned that you might consider living under her roof. If at all possible, don't go home after graduation, and be close from a distance. Q: I'm a Korean-American who fits practically every straight-laced Korean stereotype ever, and yet I am still rebuked by my parents for being disrespectful. How do I get my very Korean mom to realize that we have cultural differences and that we will not always see the world in the same way? Q: How do you convince your religious mom that your intention to marry your non-religious dude is not a hurtful slight against her, God or her culture? Jessica's Mom: Point out to her all the wonderful moral qualities your man has which are religious in spirit if not in doctrine. If this doesn't work, realize that your mother still loves you and you her, even if there are these differences. Again, this is painful, but love is always ambivalent and conflicted. Q:What is the best way to show your mom you love her and appreciate her? Doree's Mom: Buy her a copy of Love, Mom! Jessica's Mom: Empathy for what upsets your mother - this is the greatest form of caring. It is often difficult for adult children to understand and process that their parents have ongoing lives which contain pain and upset separate from their own. If you can notice when your mom is having a bad day and say you're sorry and wish her a better day, this is love. Q: How do I get my mother to connect with my husband's mother, who is very different from her? Both Moms: Give them grandchildren.